Steve Nicolini was an instructor and land steward at Alderleaf. He holds a Level III Track & Sign Certification through CyberTracker International, a Permaculture Design Certificate, and an Associate in Arts Degree from Santa Rosa Junior College. Steve was born in Novato, CA and grew up hiking and bicycling in the oak forests of the North Bay Area. He has always loved the outdoors and was inspired to study wilderness living after a life changing journey to the Amazon Rainforest. Steve is a graduate of both the Wilderness Certification Program and the Instructor Internship at Alderleaf. He has led numerous youth programs with Quiet Heart Wilderness School. Some of his hobbies include woodworking, playing the banjo, and harvesting wild foods. 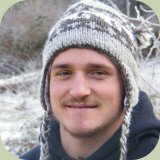 Steve continues to consult as an independent permaculture designer, stewards a historic property, and is an apprenticing electrician with plans to work in the solar industry.